With a stay at Los Prados Hotel in San Mateo, you'll be within a 15-minute walk of Lakeshore Park Beach and Los Prados Park. 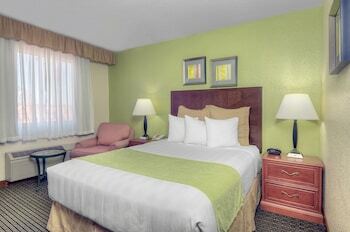 Featured amenities include a 24-hour business center, dry cleaning/laundry services, and an elevator (lift). Planning an event in San Mateo? This hotel has facilities measuring 720 square feet (67 square meters), including a meeting room. Free self parking is available onsite. With a stay at Airport Inn in South San Francisco, you'll be within a 15-minute drive of San Francisco Bay and Bayfront Park. Free self parking is available onsite.